Who doesn't like a good sandwich in this country? Sid's favorite meal is the sandwich, followed closely by the burger, followed by the steak, then the fish sandwich, then the shish kebab (or souvlaki will do nicely), and from there anything goes. Working primarily out of Ashland, OR, which has gotten itself some kind of reputation for being a culinary town, you'd think there would be a plethora of lunch opportunities - but the best is hard to find. Ashland has plenty of over-priced food available, so for the locals, brown-baggin' it has generally been the way to go. 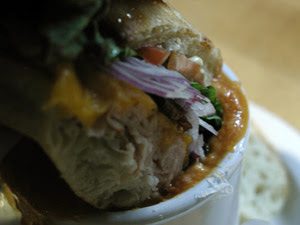 However, there is a moderate priced and easy to please soup & sandwich hot spot - Allyson's Kitchen. Allyson's Kitchen is a gourmet foods and kitchenwares store at 115 East Main St., and has featured a gourmet sandwich deli for over 6 years now. Just recently, Feb. of 2008, Allyson's Kitchen opened a new store in Bend at 375 Powerhouse Drive in the Old Mill District. Every morning they make two fresh soups, which have a reputation for being some of the best soups in town. Favorites of Sid's include the Tom Ka Gai, followed closely by Chicken Tortilla. But what good is a delicious bowl of soup without a tasty sandwich to dip in it? 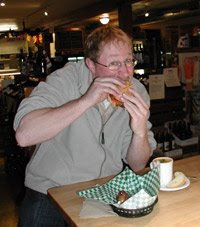 Allyson's Gourmet Deli has a simple, yet flavorful lunch menu with most of their sandwiches named to accompany the Tony Award Winning Shakespeare Festival that draws much of the tourism to Ashland. The Gourmet BLT from Allyson's has an uncanny ability to please pork connoisseurs and those who like their bacon crispy <shudder> alike. How do they do this? Well, the bacon is thick enough that they can slow cook it all the way through to please those munchers who are still worried of the first trichinosis outbreak in 80 years, but without killing the wonderful flavor of pig for those of us who do enjoy it. Often an early morning stop into Allyson's Kitchen will greet you with the scent of bacon sizzling away, and begin the Pavlovian drooling that will lead you to an unforgettable lunch. 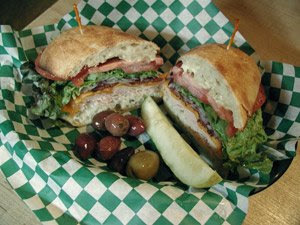 This day, I had a special request for a Titus on Ciabatta, with Cheddar Cheese and Bacon added. And a cup of soup, can't remember what kind exactly, but it was good. Sid always gets soup. The sandwich was awesome. Sid stuffed the first half away in between about 3 or 4 gasps for air, then took a minute to give the second half of this Mid-Afternoon Delight a dip in some hot creamy carrot madness. Oh, it was good. It's always a toss-up between getting the bowl of soup, or the cup of soup. 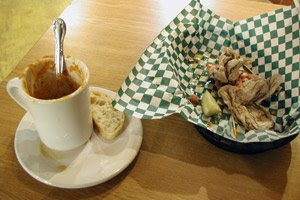 With a full bowl, you can dip the fattest sandwich, like a Cornwall (Corned Beef & Saurkrout), without much spillage, while a cup of soup will have to be drained a slurp or two to fit your sammie. You can see by one of the images, the overflow danger level of dipping too early. By and large, the flavors of smoked turkey with melted cheddar cheese were deftly accented by the red onion and smoky bacon. The Ciabatta roll is the better sandwich bread for dipping, and also a nice sandwich bread all around because The Ciabatta is sturdy, grips well and dips well, and it has a nice texture. The Creamy Carrot Soup was good and thick, to let you know that Allyson's roasts their veggies and purees the fruits to a hearty and hunger satisfying rich consistency. This soup was good. And here's where the advantage of the cup comes in. After finishing the last bite of sandwich, a satisfying pull on the coffee cup drains the rest of the of creamy soup, and Sid slowly sits back with a sigh, a smile, and root beer or one of their select microbrews. 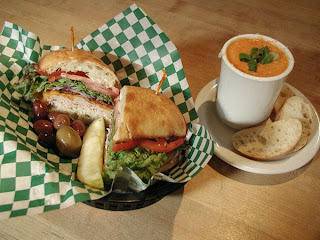 If you're ever in the Downtown Ashland, OR area, or in the Old Mill District of Bend Oregon, a lunch stop into Allyson's Kitchen will not disappoint.